Newton is a city in and the county seat of Harvey County, Kansas, United States. As of the 2010 census, the city population was 19,132. Newton is located 25 miles (40 km) north of Wichita. The city of North Newton is located immediately north, existing as a separate political entity. For millennia, the land now known as Kansas was inhabited by Native Americans. In 1803, most of modern Kansas was secured by the United States as part of the Louisiana Purchase. In 1854, the Kansas Territory was organized, then in 1861 Kansas became the 34th U.S. state. 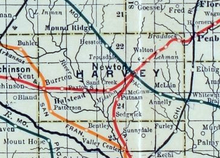 In 1872, Harvey County was founded. In 1871, the Atchison, Topeka and Santa Fe Railway extended a main line from Emporia westward to Newton by July 1871. The town soon became an important railroad shipping point of Texas cattle. The city was founded in 1871 and named after Newton, Massachusetts, home of some of the Santa Fe stockholders. In August 1871, there was a Gunfight at Hide Park, in which a total of eight men were killed. The incident began with an argument between two local lawmen, Billy Bailey and Mike McCluskie. Because of this incident, Newton became known as "bloody and lawless—the wickedest city in the west.". In 1872, the western terminal for the Atchison, Topeka and Santa Fe Railway and the railhead for the Chisholm Trail were established here. Shortly after incorporation of the city in 1872, the Newton city council passed an ordinance prohibiting the running at large of buffalo and other wild animals. During World War II, the Newton airport was taken over by the US Navy as a secondary Naval Air Station, and the main runway was extended to over 7,000 feet (2,100 m). Newton served as the Middle Division dispatching headquarters for the "Santa Fe" until the mid-1980s, when all dispatching for the Chicago to Los Angeles system was centralized in the Chicago area. In 1995, the Santa Fe merged with the Burlington Northern Railroad, and is now known as the BNSF Railway. The BNSF continues to be a large industrial taxpayer although its impact as an employer has decreased in the past decade. Most locals still refer to this railroad as the "Santa Fe". On February 25, 2016, Newton was the site of the first of several related shooting incidents, which culminated in a mass shooting at an Excel Industries building in nearby Hesston that left three people dead and twelve others injured. The shooter, identified as Excel employee Cedric Larry Ford, was then killed by responding police officers. Newton is located at 38°2′39″N 97°20′51″W﻿ / ﻿38.04417°N 97.34750°W﻿ / 38.04417; -97.34750 (38.044089, -97.347597). According to the United States Census Bureau, the city has a total area of 12.60 square miles (32.63 km2), all of it land. The city is in the central portion of the continental United States. U.S. Highway 81, also known as the Meridian Highway, stretches from Winnipeg, Manitoba, Canada to Mexico City, Mexico through Central and South America. It passes through Newton, Kansas and is known as "Main Street." U.S. Highway 50 runs past the White House in Washington, DC through Newton, Kansas and continues on to Sacramento, California. The climate in this area is characterized by hot, humid summers and generally mild to cool winters. According to the Köppen Climate Classification system, Newton has a humid subtropical climate, abbreviated "Cfa" on climate maps. Newton is included in the Wichita metropolitan statistical area (MSA). It is located in Harvey County which is an agricultural and small manufacturing county with 34,361 people. Harvey County Kansas is part of a 5 county Metro Area with 650,000 people, the largest anchored in the state of Kansas. The major city in this metro area is Wichita, Kansas, 20 miles (20 minutes) to the South via I-135. As of the census of 2010, there were 19,132 people, 7,584 households, and 5,045 families residing in the city. The population density was 1,518.4 inhabitants per square mile (586.3/km2). There were 8,237 housing units at an average density of 653.7 per square mile (252.4/km2). The racial makeup of the city was 88.4% White, 2.2% African American, 0.9% Native American, 0.8% Asian, 4.7% from other races, and 2.9% from two or more races. Hispanic or Latino of any race were 16.3% of the population. There were 7,584 households of which 33.1% had children under the age of 18 living with them, 51.5% were married couples living together, 10.3% had a female householder with no husband present, 4.7% had a male householder with no wife present, and 33.5% were non-families. 29.1% of all households were made up of individuals and 12.3% had someone living alone who was 65 years of age or older. The average household size was 2.46 and the average family size was 3.01. The median age in the city was 36.8 years. 26.4% of residents were under the age of 18; 7.9% were between the ages of 18 and 24; 24.9% were from 25 to 44; 25% were from 45 to 64; and 15.9% were 65 years of age or older. The gender makeup of the city was 48.4% male and 51.6% female. As of the census of 2000, there were 17,190 people, 6,851 households, and 4,610 families residing in the city. The population density was 1,794.0 people per square mile (692.8/km²). There were 7,277 housing units at an average density of 759.5 per square mile (293.3/km²). The racial makeup of the city was 86.73% White, 2.30% African American, 0.53% Native American, 0.66% Asian, 0.03% Pacific Islander, 6.84% from other races, and 2.92% from two or more races. Hispanic or Latino of any race were 12.73% of the population. There were 6,851 households out of which 31.9% had children under the age of 18 living with them, 54.2% were married couples living together, 9.6% had a female householder with no husband present, and 32.7% were non-families. 28.9% of all households were made up of individuals and 12.1% had someone living alone who was 65 years of age or older. The average household size was 2.43 and the average family size was 2.99. In the city, the population had 26.3% under the age of 18, 8.1% from 18 to 24, 28.2% from 25 to 44, 20.8% from 45 to 64, and 16.5% who were 65 years of age or older. The median age was 37 years. For every 100 females, there were 93.3 males. For every 100 females age 18 and over, there were 90.1 males. The median income for a household in the city was $38,236, and the median income for a family was $45,703. Males had a median income of $32,308 versus $21,906 for females. The per capita income for the city was $18,529. About 5.1% of families and 7.9% of the population were below the poverty line, including 9.7% of those under age 18 and 5.6% of those age 65 or over. Warkentin House, a Victorian house museum. Sand Creek Station Golf Course, 18-hole public course, ranked among 2006's best new public courses in America by Golf Digest. Walton Rural Life Center (in Walton). Bethel College is located nearby in the city of North Newton. Hutchinson Community College has a satellite campus at the Axtell Education Center, close to downtown. Newton is served by local media as well as that of Wichita and national media. The following lists include both local media and media from the Wichita MSA. The Newton Kansan (GateHouse Media) serves Newton and the surrounding area as the daily local newspaper. It is not published on Sundays or Mondays. The Wichita Eagle is the major newspaper for the region. The Newton Now newspaper is also a newspaper based in Newton and covers some of Harvey County. BNSF Railway pass through Newton for transportation and shipping. Amtrak's Southwest Chief stops in Newton twice each day and provides passenger rail service towards Los Angeles and Chicago. The Amtrak station is located at 414 N Main St. Bus service is provided daily towards Wichita and Salina by BeeLine Express (subcontractor of Greyhound Lines). Major roads that pass through Newton are I-135, US-50, US-81, K-15. Newton City/County Airport, FAA:EWK, is located 2 miles east of Newton. Its 7,002-foot (2,134 m) runway is one of only 11 runways in Kansas 7,000-foot (2,100 m) or longer. It has ILS and GPS approach. Cable is provided by Cox Communications. DSL is provided by AT&T. Wireless is provided by Pixius Communications. Landline is provided by AT&T. Cellular is provided by Verizon Wireless, Sprint, and AT&T Mobility. Gas is provided by Kansas Gas Service. City is provided by City of Newton. Rural is provided by Harvey County RWD #1. Sewer is billed by City of Newton. Trash is billed by City of Newton. An Atchison, Topeka & Santa Fe Railway route map from 1891 issue of Grain Dealers and Shippers Gazetteer. Samuel Peters (1842–1910), Captain in Union Army (1861-1865), Kansas State Senate (1874-1875), Judge of 9th District (1875-1883), U.S. House of Representatives (1883-1891), editor of Newton Daily Kansas-Republican (1899), postmaster in Newton (1898-1910), lawyer in Newton and Marion. Jacob Schowalter (1879–1953), philanthropist, founder of Schowalter Foundation, Kansas State Representative. ^ a b c d e f Geographic Names Information System (GNIS) details for Newton, Kansas; United States Geological Survey (USGS); October 13, 1978. ^ Blackmar, Frank Wilson (1912). Kansas: A Cyclopedia of State History, Volume 2. Standard Publishing Company. p. 367. ^ "Excel Industries shooter identified as Cedric Ford". KWCH. February 25, 2016. Archived from the original on February 26, 2016. Retrieved February 25, 2016. ^ Berman, Mark; Miller, Michael E. (February 25, 2016). "Kansas gunman kills three people and injures 14 people, sheriff says". The Washington Post. Retrieved February 25, 2016. ^ "4 dead, 14 injured in Kansas shooting, shooter ID'd". Russia Today. February 25, 2016. Retrieved February 25, 2016. ^ "Gunman Among 4 Dead, 14 Hurt in Kansas Workplace Shooting". NBC New York. February 25, 2016. Retrieved February 25, 2016. ^ Eversley, Melanie (February 25, 2016). "Multiple dead plus shooter after Kansas shootings; up to 20 injured". USA Today. Retrieved February 25, 2016. ^ Newton Bible Christian School. ^ "Keeny, John Ephraim". Louisiana Historical Association, A Dictionary of Louisiana Biography (lahistory.org). Archived from the original on December 1, 2010. Retrieved December 27, 2010. Bernhard Warkentin and the Kansas Mennonite Pioneers; David A. Haury; Mennonite Life; December 1974. Wikimedia Commons has media related to Newton, Kansas. Wikivoyage has a travel guide for Newton (Kansas).